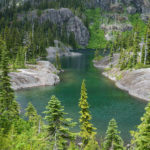 When I first stumbled across Kevin Thurner’s website, I was completely amazed and inspired by his collection of photos from the North Cascades and beyond. I recently emailed Kevin some questions to learn more about his photography. Be sure to spend some time browsing through Kevin’s online gallery. 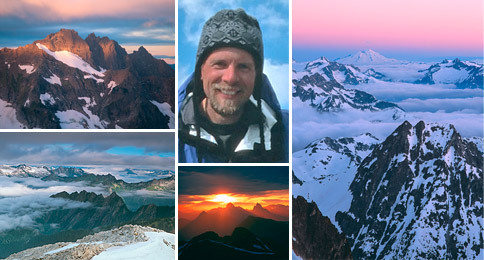 You have an extensive portfolio of photos from the Washington Cascades. What is it about these mountains that draw you so? This goes right to the point I suppose, but is tougher to answer than you might expect. I’ve sometimes thought of my time in these mountains as a kind of relationship. It’s been a progression of sorts as most things are. Not being a native of the Pacific Northwest, I didn’t know much about the Cascades for quite some time. I gradually became aware of their alpine reputation in a very general way, mostly through news accounts of the Himalayan feats of various Northwest climbers. I remember at one point coming across a few small photos of the North Cascades in an outdoor magazine that tantalized me, but offered little more to go on. They remained in the back of my mind as a kind of mysteriously veiled mountain kingdom. In the early 80’s I hitchhiked through parts of Washington State more than once and glimpsed Mt Rainier for the first time. Then a few years later, I saw a copy of the Beckey Guides in a climbing store in Boulder, Colorado. The pictures in those books confirmed to me that these were mountains of an altogether different character than the ranges I’d explored. They even intimidated me a little and I began to think of them as mountains of a different caliber. My first year in the North Cascades was punctuated by many memorable mountain sojourns, but none as remarkable as the four days I spent over Labor Day weekend approaching and climbing Luna Pk. It was my first view of the Picket Range, and man was I hooked. It became clear to me on that trip that these awesome mountains were within my grasp. What I lacked in technical ability I could make up for with stamina, good route-finding and perseverance. These mountains exuded a different kind of wildness, and their northern, alpine character appealed to me immensely. My time in the North Cascades has often been tremendously satisfying; and now I have been around them long enough to have built up a rather strong affection. It is still very much a Mountain Kingdom to me. When you go out in the mountains, do you usually go out with friends or alone? How long are you usually out there on each trip? My own trips have most often been done alone. Part of this derives from the practical freedom that going solo provides; part is simply a reflection of my somewhat shy personality. I do sometimes share trips with companions however, and these can be the best of times. Longer trips are ideal for reaching the more remote parts of the range, but even day hikes can bring some remarkable experiences. There are several well known traverses of about a week’s length that are popular to varying degrees, but one of the appealing aspects of the North Cascades is the multitude of unique traverse routes that can be done. Some have taken this to truly epic proportions, and the following link provides some inspiring reading on this score: http://www.mountaineers.org/nwmj/05/051_GrandTour1.html. When you head out, do you have preconceived ideas for potential photographs? I sometimes do, yes. I’m very aware of position and vantage when I consider a route and also as I move through an area during a trip. The relative positions on the horizon of sunrise and sunset, moonrise and moonset during different seasons are things I notice. I often try to envision what the view might be from a given geographic point and sometimes these imaginings can change an unlikely and difficult to reach place into an irresistible destination. This is one reason I have sometimes sought out minor ridges and lower summits with difficult approaches. Such destinations are off the radar of most backcountry travelers. If you had to choose one or two personal favorite photos from your collection, which would they be, and why? 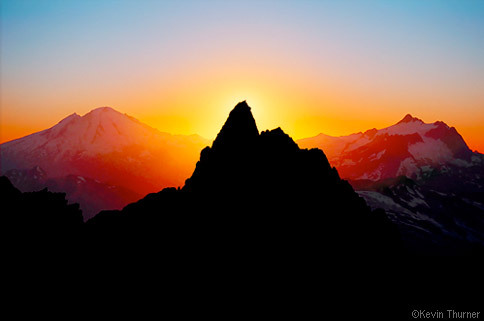 The image currently on my website’s homepage is titled “Mt Terror in Silhouette” and it does hold a special place for me. There are moments when we find ourselves uniquely privileged to witness or participate in extraordinary events. The most powerful of these can become signposts in the stories of our lives and imprint themselves upon our futures. The moment of this photograph was such a moment for me. It’s difficult to overstate the rarity of the event that this image captures or the magic it held for me at the time. 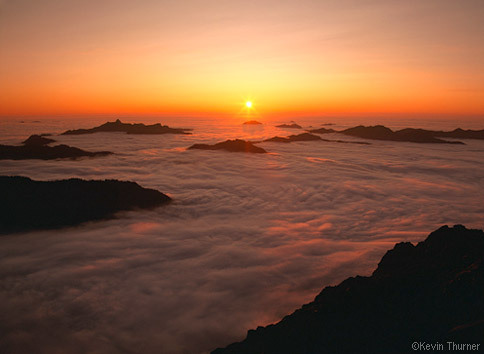 It is also one of a handful of my early images that I could see were truly exceptional. They made it seem reasonable that I should pursue such things. 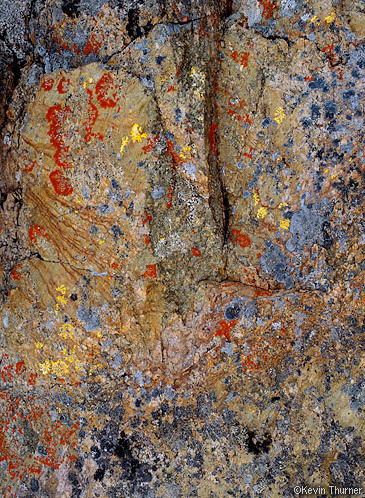 Another favorite is titled “Figures in Rock and Lichen”. This was one of my first successful abstract images and led me to think more deliberately about what we perceive as beautiful and why. Because it was taken on a sullen, cloud-veiled day, it also taught me the value of vigilance in unlikely conditions. Years later, this sentiment distilled into a mantra useful to me in the course of an extended bicycle tour of Norway that featured the region’s rather challenging weather. It is a saying I keep in my store of inner dialog: “Find the Beauty”. Are there any particular photographers/artists who have inspired you and affected your work, and how so? Early on I took notice of the photographers whose images graced the books, calendars and magazines of organizations like the Sierra Club and the Audubon Society. I admired many of these images and learned a great deal from viewing them. One man’s influence stands out however. “Mountain Light” is the only photography book I have ever owned. Beyond individual images themselves, Galen Rowell brought out for me the spirit of what wilderness photographs could aspire to be. Interestingly, it was his prose as much as his images that grabbed my interest. This aspect of his work has greatly informed my own development as a photographer. What is the most challenging aspect of photography for you? There are many. While on a hike, a friend of mine once commented on my striking resemblance to a pack animal. Indeed, those who encounter me on a trail are unlikely to forget the man with the tripod case integrated on his hefty backpack and the large camera bag suspended in front of him. Aside from the physical challenges though, the photography itself comes by degrees. There are of course technical equipment/medium challenges and there are challenges of readiness and strategic judgment. These are all preparatory however. Creative sensibility is the root of an evocative image, and fitting this very personal sense of vision and awareness to the world before you is the real challenge. By its very nature, there is no single way to achieve this. The great thrill of photography for me is in exploring this dynamic realm. That’s what it’s about. I’m sure many of your photos have stories behind them. Do you think that for the viewing public, these stories contribute to the image, or is it best to let the viewers interpret them for themselves? I don’t think there is a single answer to this for all images. A large part of the attraction of visual art is its wordless, emotional appeal to the viewer. People carry unique histories and engage unique perceptions. Some will be overwhelmed at the sight of a particular image, while others may see no compelling value. There is a difference between telling the story of a photograph and trying to state some sort of interpretation of its meaning. The former in my opinion can sometimes enhance appreciation for an image and bring the viewer closer to the photographer’s experience. The later however, is pretentious at best and can be ruinous to a viewer’s empathy. Where in the world would you most like to visit in the future? Given the time and the means, I might never stop traveling. The world is a big place and a lifetime is not enough to explore all of its varied treasures. Short visits have their place, but I am happiest when I have the time to know an area well either by living there or through extended or repeated visits. These opportunities are not common for most of us, but they can happen. Thank you, Kevin! I hope to see many more mountain photos from you in the future. Posted in Articles on April 6, 2008 April 9, 2008 by Jack Brauer. Exquisite photography! As impressive is Kevin’s ability to put in words what he sees and feels. Thank you! These are some very inspiring articles, Jack! Thanks for bringing these adventurers to the forefront.